I had been anticipating the arrival of this box for just over a month. For most women, this sort of anticipation might accompany the arrival of a new outfit. Or perhaps a new pair of shoes. Or a new handbag. The reason the delivery took so long to arrive is because I ordered the goods from a bike store in Germany. Even after considering the cost of international shipping, the order was a helluva lot less expensive than ordering the same items through bikes stores in the US. Go figure! The contents of the box: 4 tires, 3 tubes, and 1 e-Werk. One set of tires is to replace my Schwalbe Marathon Plus tires -- if and when my current tires ever need to be retired. My current tires have ~4000 miles on them and have not yet experienced any flats. Schwalbe Marathon Plus tires are the bomb! The second set of tires are Schwalbe Marathon Mondial tires. These are wider and have more tread than the other tires. The Mondials are for my off-road tour, which is scheduled to begin after the Sierra-Cascades ride is complete. The tubes are for the Mondial tires. And the last item -- the e-Werk (made by Busch & Müller) -- is something I've been wanting to purchase for a few years now. Let's just say that my delayed gratification has now been gratified. 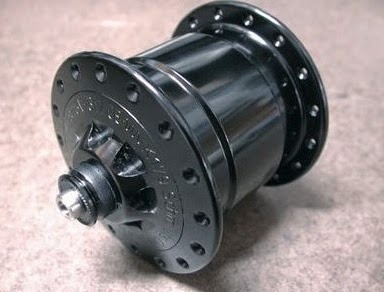 About two years ago, I decided to invest in a Schmidt Dynamo Hub (the SON28 Classic). This hub sits in the middle of my front wheel and serves to generate energy as the wheel turns. The energy is then diverted to power my front and rear lights. No longer did I require batteries for my lights -- I was now off-the-grid. The Schmidt SON28 Dynamo Hub. This set-up -- namely the dynamo hub and the lights -- was a fairly significant investment for a set of lights, and so I wasn't quite ready to make the final purchase to round-out the complete off-the-grid set-up. But it's two years later now, and I'm ready to finish the rounding-out. With the acquisition of my e-Werk, I am now completely off-the-grid. So, what exactly is an e-Werk? Well, this little powerhouse enables me to divert energy created by the dynamo hub to charge my electronic devices, including my iPad, my iPod, my phone, and my SPOT satellite device (which I will use for my off-road backcountry trip later this summer). In layperson's terms: My muscle power is enabling me to charge my electronic devices. The voltage provided by the e-Werk depends on the speed at which the wheel is moving. While the e-Werk is capable of charging many devices directly, the current isn't constant enough to charge my iPad. So, I purchased a battery to gather the power generated by the hub. This battery, in turn, delivers a constant charge to my iPad and other devices. After a bit of research, I settled on the Limefuel Blast battery (15600 mAh). It has a great reputation, and it allows me to charge two devices at a time. Plus, if available, I can charge the battery directly from a wall outlet. The Limefuel battery and the various cords I'll need to charge my devices. The e-Werk mounts perfectly on Shirley's head tube. Can you spot the e-Werk? I look forward to using my new e-Werk to be entirely off-the-grid while entirely on the bike. I'm looking forward to utilizing the new system. I'll keep you posted on how the set-up is working. jealous...look like a fun set up.